via GlacierNPS flickr. Plowing, spring 2015. 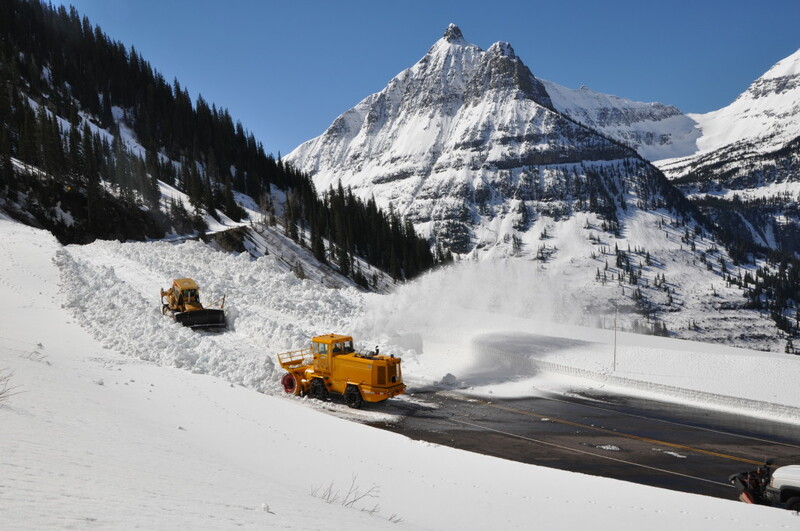 When plowing starts on the Going-to-the-Sun Road in Glacier National Park, all of us here in Northwestern Montana start to realize that summer really is right around the corner. But the true treat of spring is on its way first: biking. Every year, park visitors flock to cycle the Going-to-the-Sun Road, following the plows as they work. Since the road remains closed to cars while plowing continues, bikes have free range to scale the heights of Logan Pass, with the view stretching out below. Of course, just because the plowing process has started, doesn’t mean we’re close to getting to drive over Logan Pass. That’s why it’s time to savor the opportunity to pedal sections of the country’s most scenic route without the hum and roar of engines to disturb the peace. Take a look at the FAPQ (frequently asked plowing questions) below to get all the info you need to explore spring in Glacier Country! How does the plowing work exactly? Crews start at the east and west ends of the road, moving toward Logan Pass and moving 4000 tons of snow an hour as they go. Areas like the Big Drift can leave up to 90 feet of snow to move off the road. How far can I bike? Track the road closures and openings here. During plowing hours, the road is closed a set distance behind where the plows are working. After plowing hours, the road is at your disposal, although the park service advises caution as you move through snowy areas. When will the road be open to cars? This year, there is no set date for the road opening. In the past when there was a set date, the only thing that really meant was that the road wouldn’t be open before the date. Plowing takes about ten weeks, but that all depends on snow levels and road status, and unexpected snowstorms could always delay things, leaving more time for car-free biking! Watch the plows move along the road in real time here. Track road closures and openings here. See the insane amounts of snow on the NPS flickr account here. Rent a bike from our front desk or book a trip with one of our partners and experience the adrenaline for yourself! Throwback Thursday – The Lodge’s History Antelope Cabin Redesign!